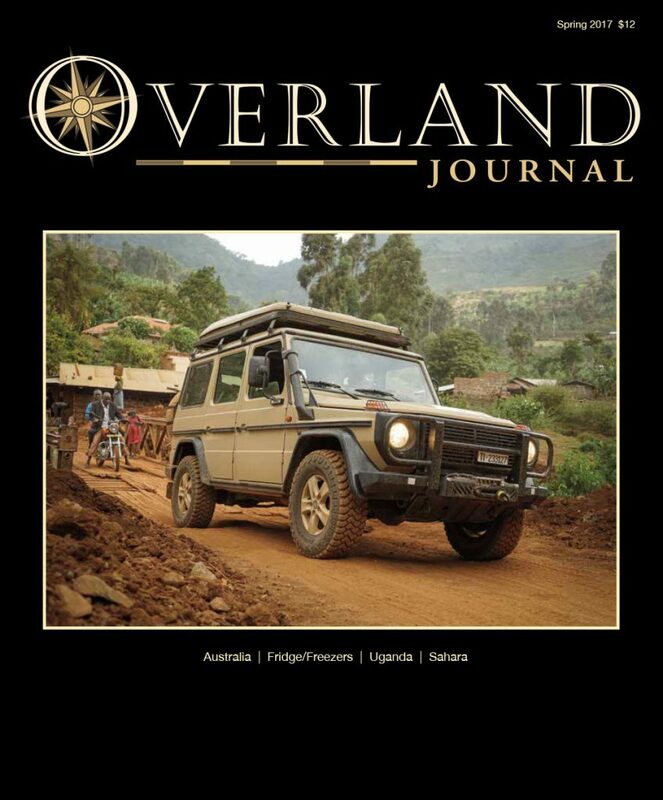 A big THANK YOU to the publications, blogs and media that have showed interest in covering our overland story. We sincerely appreciate your support. 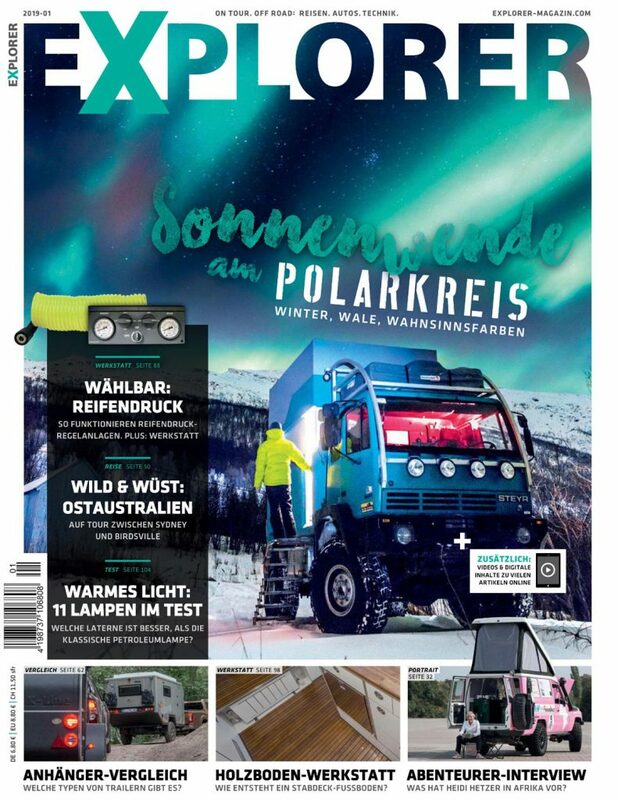 Explorer Magazin, a renowned vehicle adventure publication out of Germany, featured one of our photos as a two-page spread in the Position section of their latest issue; January 2019. 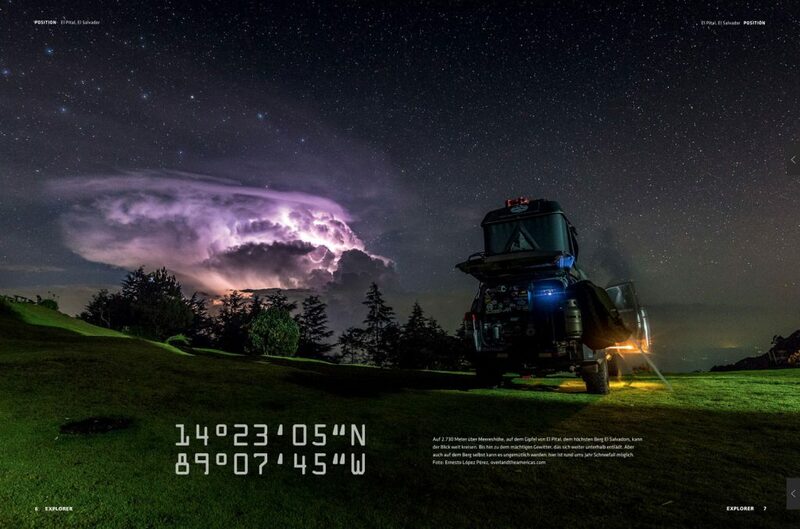 We're honored and happy to have had the opportunity to contribute a photograph taken while we were camping under a starry night and a solitary storm cloud that was putting a lightning show at El Salvador's highest point, Cerro El Pital. If you speak or want to practice your German check them out! 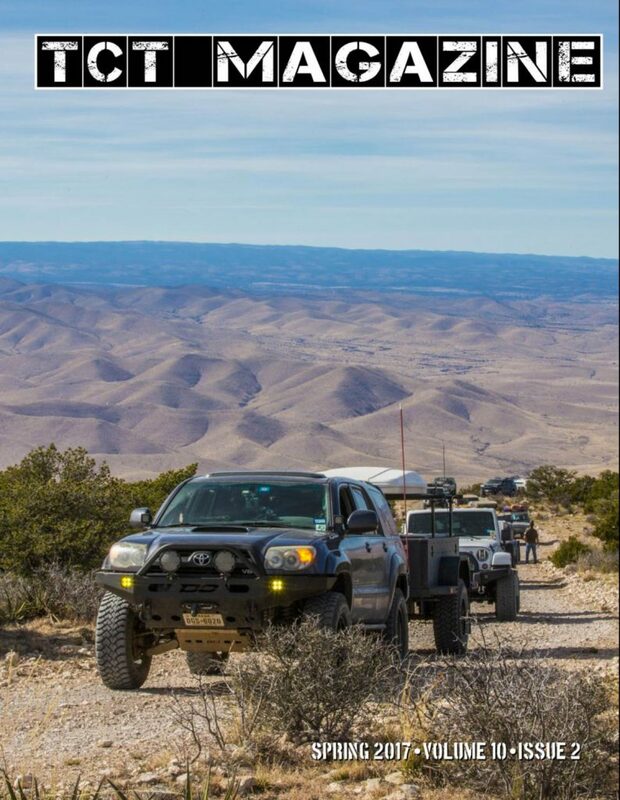 We had and awesome conversation with our friends at GHT Overland Posdcast! . – Check out the podcast interview here! "Thinking about international overland travel? Crossing international borders can seem scary, Taisa and Ernesto tell you their prospective, breaking it down to simple with smart planning and prospective. We also talk about mapping, communication and vehicle maintenance. Solid intel you want to check out!" 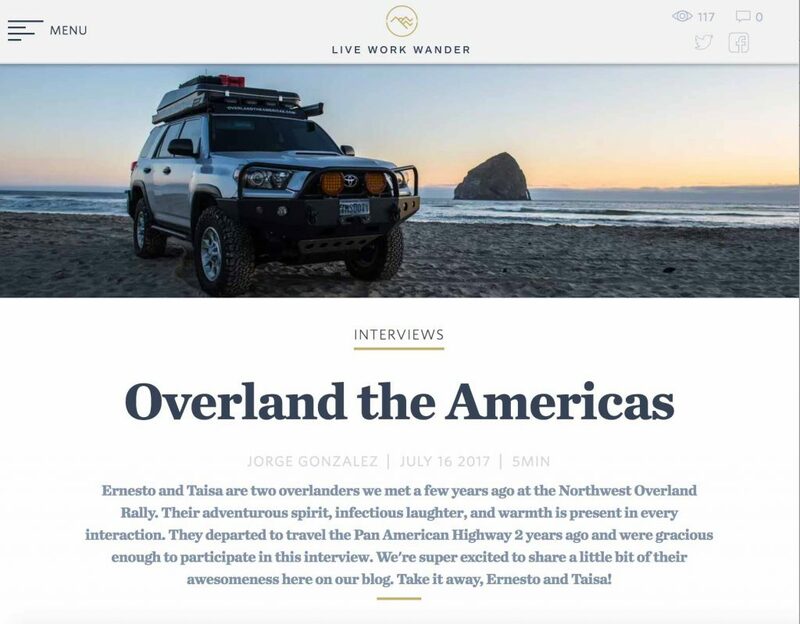 "Ernesto y Taisa, una pareja de overlanders, aceptaron una entrevista a la revista TODO TERRENO 4X4, donde nos contaron sus experiencias recorriendo el mundo sobre una SUV. 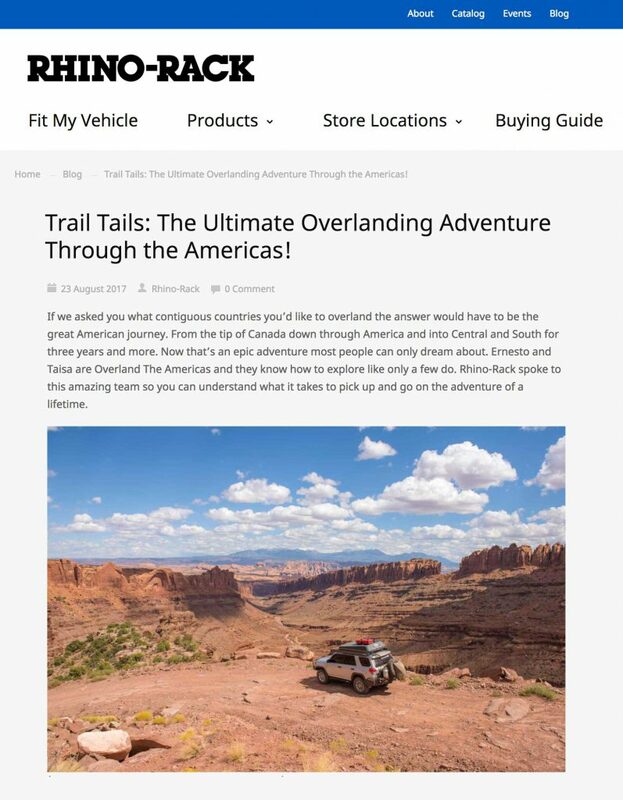 Desde hace un poco mas de dos años, un venezolano y una norteamericana comenzaron a transitar por varios países en su propio auto; sus aventuras estan registradas en su página web OverlandTheAmericas.com"
Our friends at Rhino-Rack USA asked us a few questions about our trip and prefaced the interview with a super kind introduction. Thank you so much guys. We're just two vagabonds. – Read more about our conversation with Rhino-Rack USA here! "If we asked you what contiguous countries you'd like to overland the answer would have to be the great American journey. From Canada down through America and into Central and South for three years and more. Now that's an epic adventure most people can only dream about. 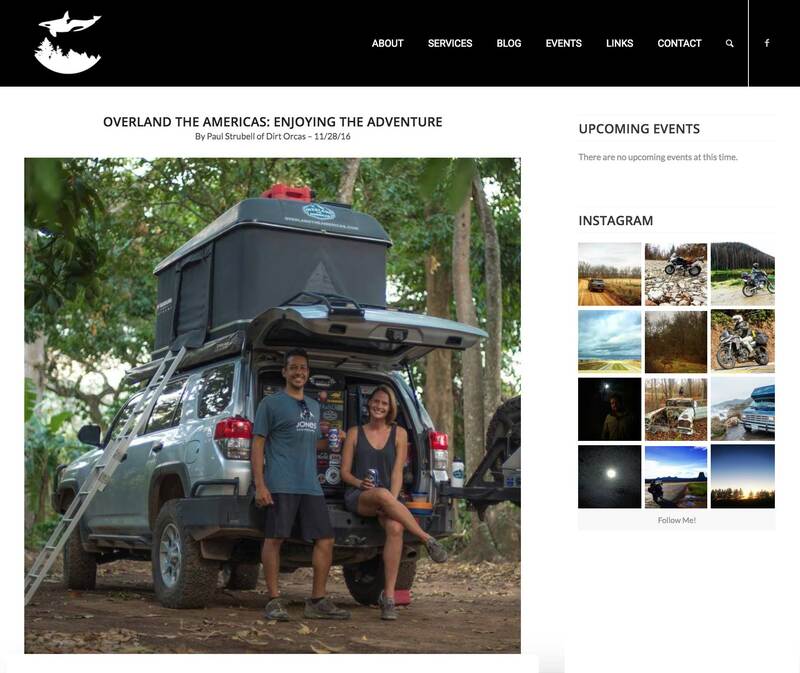 Ernesto and Taisa are Overland The Americas and they know how to explore like only a few do. Rhino-Rack spoke to this amazing team so you can understand what it takes to pick up and go on the adventure of a lifetime." 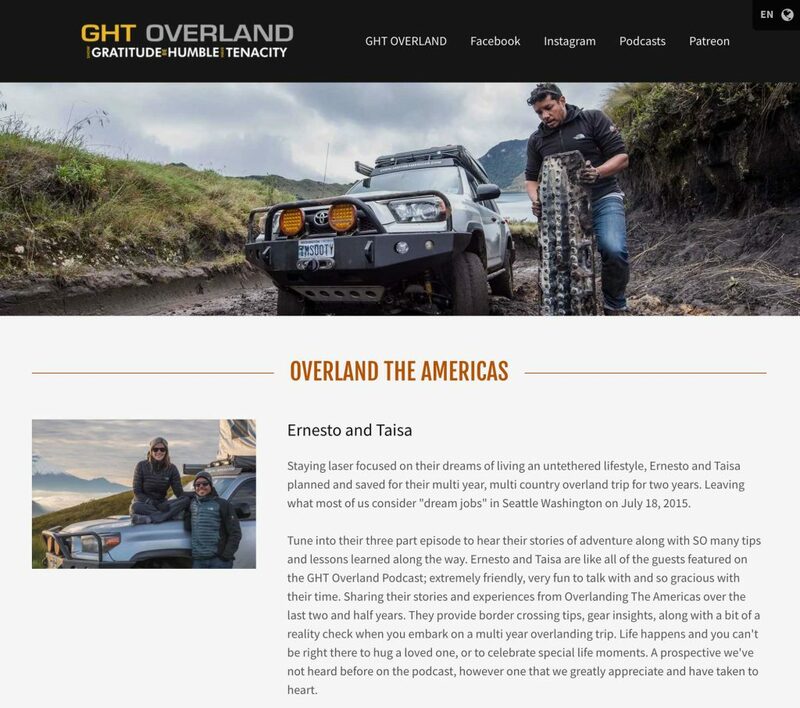 "Ernesto and Taisa are two overlanders we met a few years ago at the Northwest Overland Rally. Their adventurous spirit, infectious laughter, and warmth is present in every interaction." Brandon Libby and our friends at TCT Magazine included us in the 2017 Toyota Overlanders List. Get your TCT Magazine subscription and check it out! Thanks guys! we're honored. "Their travels and adventures inspire us to step out into the world and truly experience life. 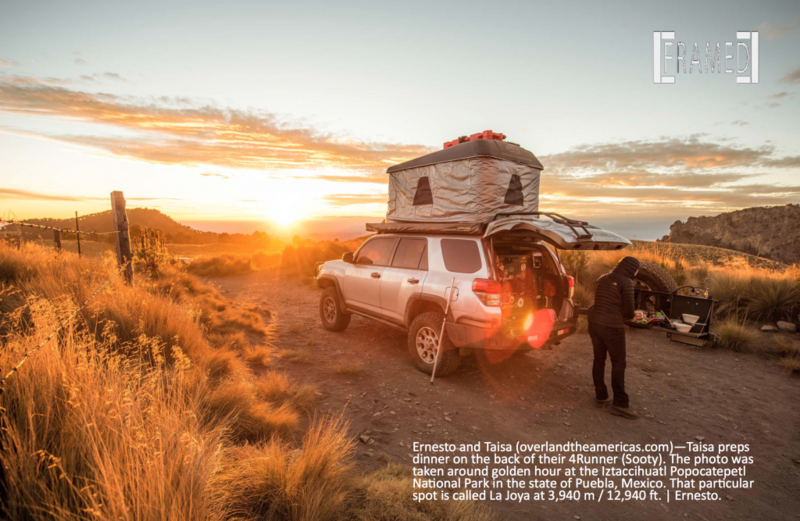 We have followed along as they visit remote villages in South America, cross desserts in Africa, and traverse mountain passes in Asia These are the full time overlanders traveling in Toyotas. As a way to give back to the community we would like to share their stories and help connect you, our readers, with their adventures. 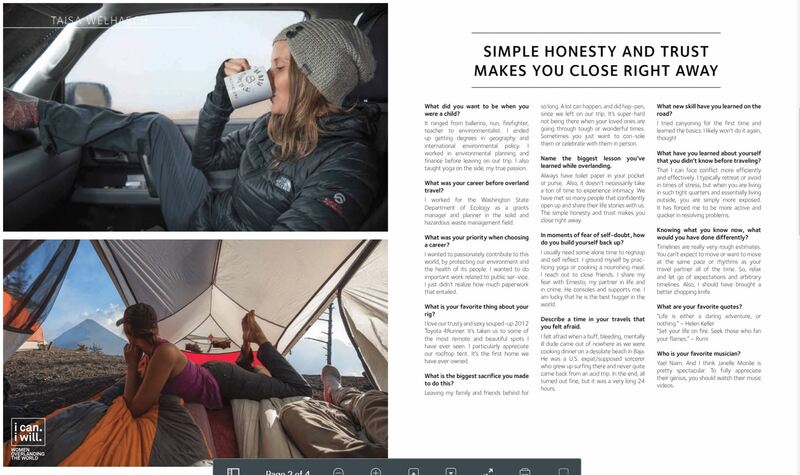 Please take a moment to learn more about these adventure travelers as they are the ones that inspire us to get out and explore"
We're really excited to be featured in Proven Overland Magazine's first issue! We've even made it on the cover!!! 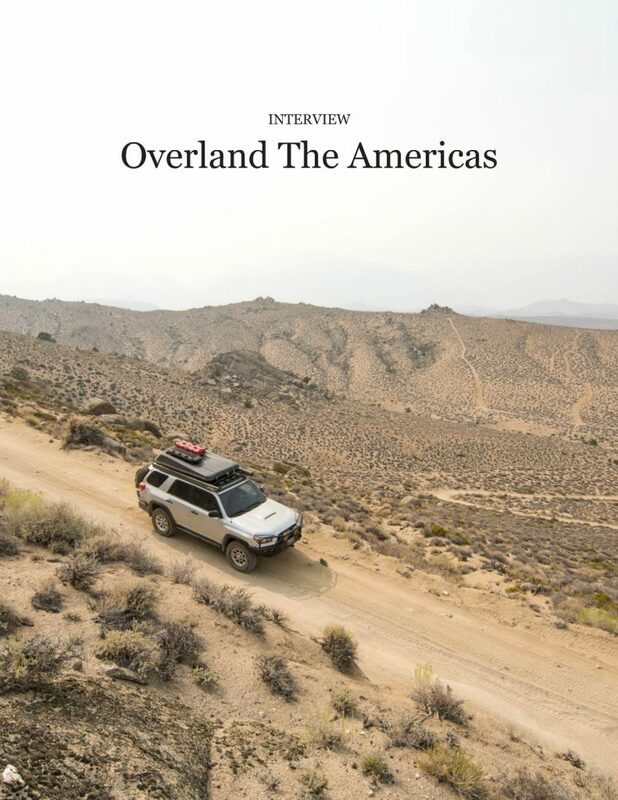 Scroll down to read our interview with Proven Overland Magazine – Michael Stolz, founder and publisher of Proven Overland, has delivered an amazing publication packed with 100 pages of great overland content; including a short interview with us. But best of all, is that we get to read the always inspiring stories from our good friends @ThisMustBeThePace and @PoseidonsBeard and the great adventures of our peeps @OX_Overland, @IamRoamR, @RockCreekOverland, @ThatVanagain, @OverlandExposure and @RoadLyfe. Make sure to check out Provenmag.com and get inspired!!! Thanks Michael, for the uber nice introduction and for sharing a little bit of our story with your readers. "Do you ever sit there just scrolling through Instagram hoping you’ll run into a new post by your favorite instagrammers? Well we do, and we are always stoked when @OverlandTheAmericas posts something new for us to drool over. Ernesto and Taisa have been one of the most inspirational overloading couples we follow, well you know they’re tied with @DeskToGlory. But that’s a story for another time. 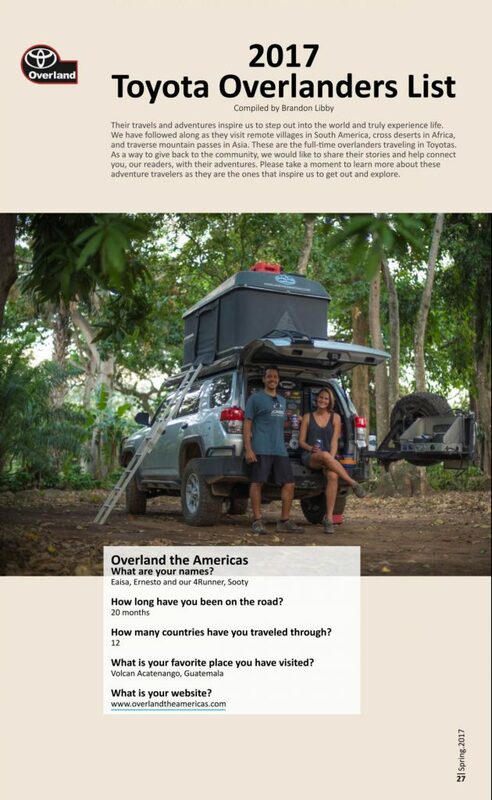 Ernesto and Taisa left Seattle in their trusty Toyota 4runner in mid-2015 to explore all 23 countries in the Americas. We were able to catch up with Ernesto and Taisa via email and asked them some questions about their inspiring trip." 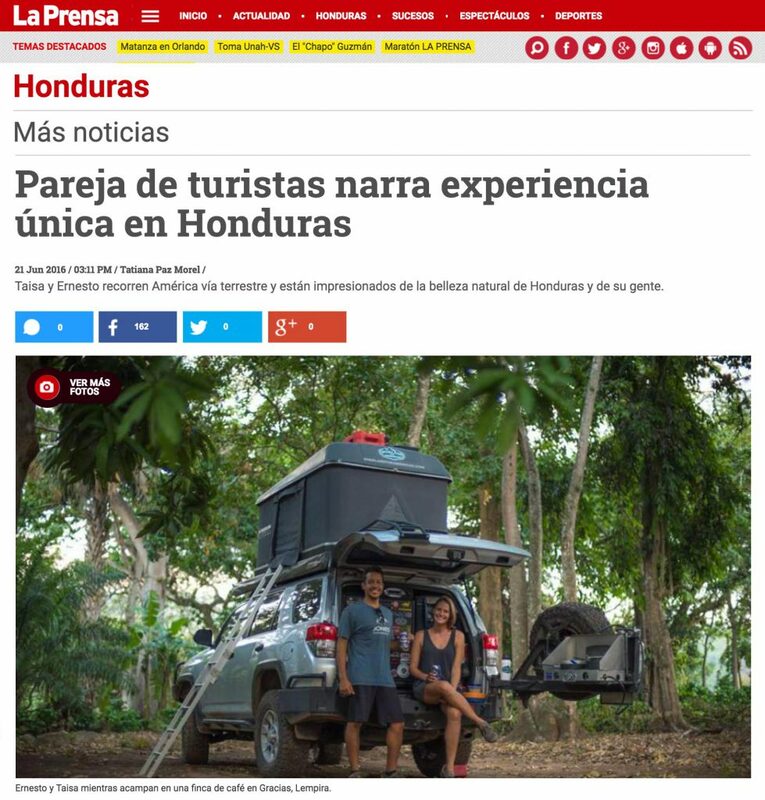 Taisa y Ernesto, una pareja que decidió recorrer 23 países de América, se encuentran actualmente en Honduras y se muestran impresionados por su belleza natural y la calidez de los hondureños. Interview with Vagabroads for their book "I Can. 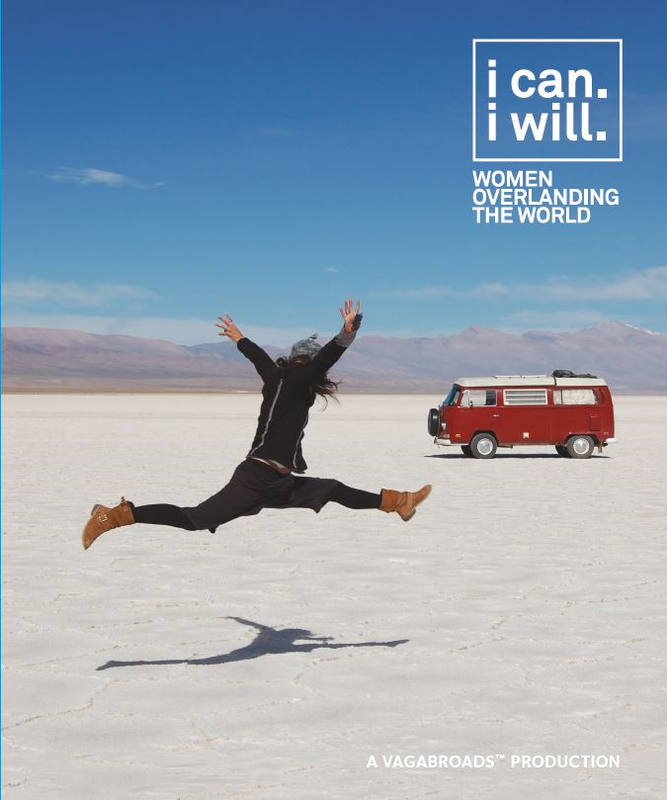 I Will - Women Overlanding The World"
Our friends Karin and Sunny (Vagabroads) put together an incredible book that tells the stories of 50 amazing women overlanding the world. – Check out and support the adventurous women discovering our planet. Taisa is also featured in this wonderful book! "Simple honesty and trust makes you closer right away". "After three years of careful planning and saving, Taisa and Ernesto loaded into their Toyota 4Runner and pointed the car south. They didn't know how long they would be gone or where exactly they would stop along the way, but they knew they wanted to go to all 23 countries as they traversed across Central and South America in Sooty - their Toyota 4Runner named after the Sooty Shearwater bird that migrates up to 40,000 miles a year. These lovebirds met in 2002 when Taisa was studying abroad in Ernesto's hometown in Venezuala. Then the realities of real life fully kicked in. Taisa was an ecologist dedicated to waste management and Ernesto was working 60+ hour weeks as a graphic designer, but they were both craving more nature than the weekend was providing. Vanlife and Overlanding are depicted in a variety of ways on social media, some good, some not so good, and some absolutely incredible. 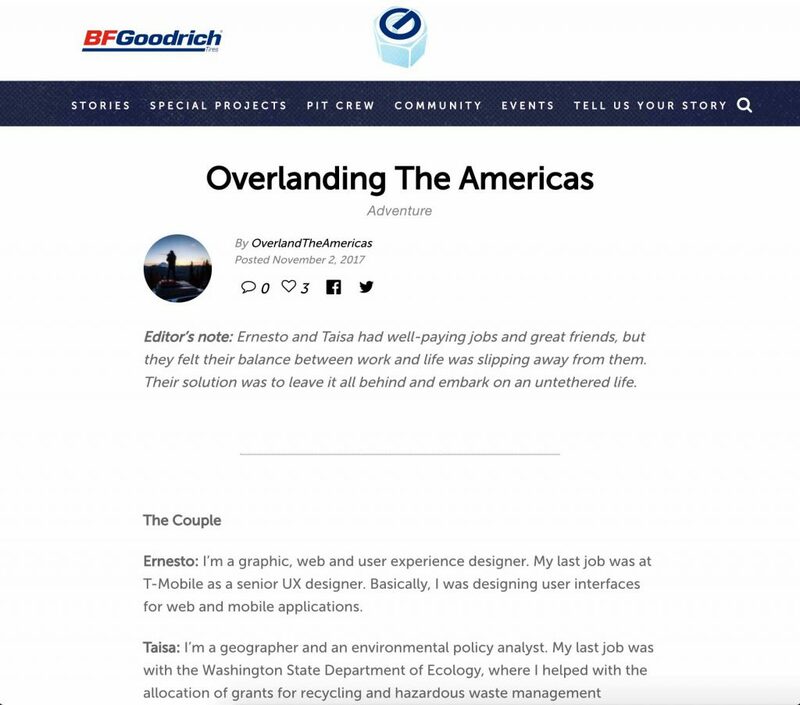 Taisa and Ernesto's account, @overlandtheamericas falls into the incredible category. And, It made us wonder, what goes into to creating and building a beautiful travel-blog? Their account is visually flawless and will inspire anyone to get out on the open road. We also were excited to tap into Taisa's waste management expertise. Unfortunately, all of the locations depicted online are not necessarily picture perfect in reality. A problem very near and dear to our hearts is the massive environmental waste & disposal problem most developing countries struggle with- trash is everywhere. We hope you enjoy the conversation as much as we did." Listen to our Podcast interview with Wheel Travel Far here! While traveling with our friends viajando nós 4x4 and Aldo, Vera and Toto in Gurupi, Tocantins, Brazil the local channel did a little interview with us. Check it out! We were very honored and excited to hear from BFGoodrich Garage about their interest in our journey! . – Check out the our interview here! "Ernesto and Taisa had well-paying jobs and great friends, but they felt their balance between work and life was slipping away from them. Their solution was to leave it all behind and embark on an untethered life." 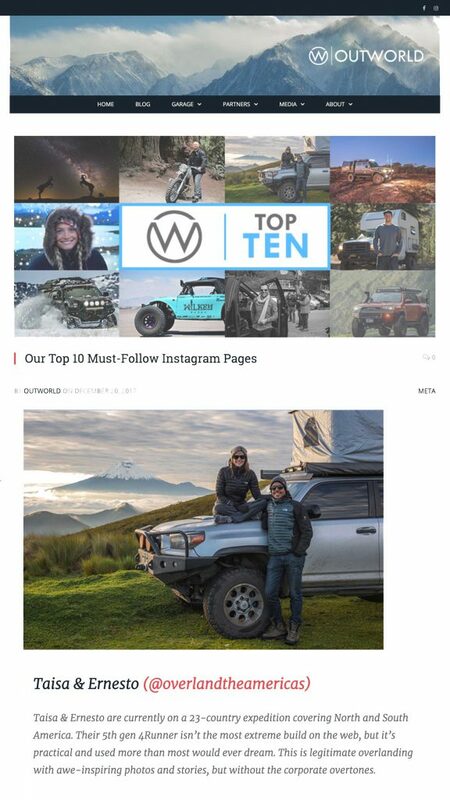 We're humbled to be included in OUTWORLD's 10 Must-Follow Instagram Accounts! Thank you so much guys! Taisa & Ernesto are currently on a 23-country expedition covering North and South America. Their 5th gen 4Runner isn’t the most extreme build on the web, but it’s practical and used more than most would ever dream. This is legitimate overlanding with awe-inspiring photos and stories, but without the corporate overtones." 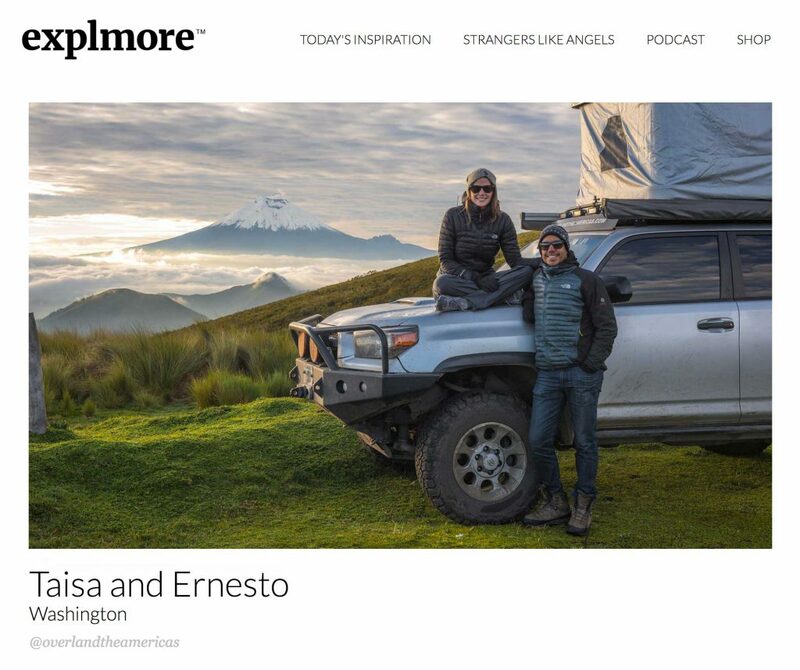 We are honored that our friend, Charles from Explmore featured us in the “Today’s Inspiration” section of his website! Check out this sneak peak into our travel experience. Read the full interview here. 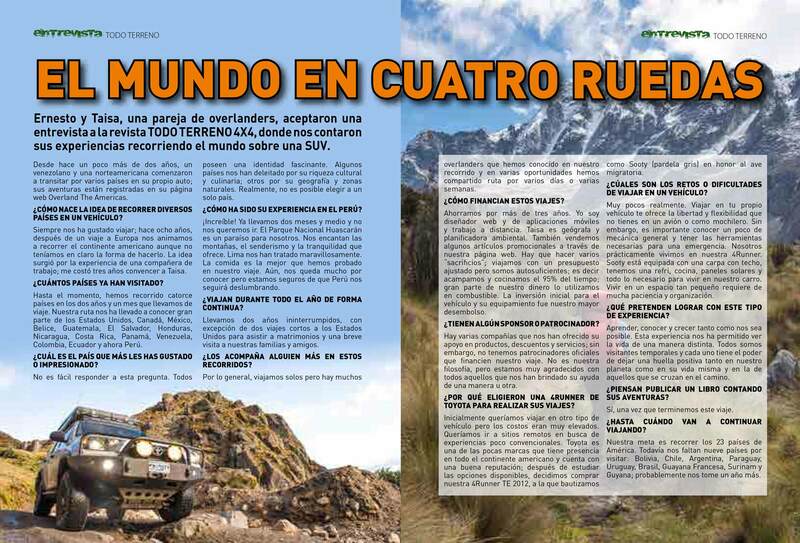 Our friend Klaus Moreau, Nancy Diaz of Mundo Turca in Lima, Peru and Mitsui Automotriz worked on putting together this video interview and offered us the opportunity to share a little about our overland trip through the Americas. Thank you very much guys! This is a short interview we had with The Ministry of Tourism of Ecuador in the beautiful city of Cuenca about our trip and experience in the country. Thank you so much for the warm welcome Ecuador! 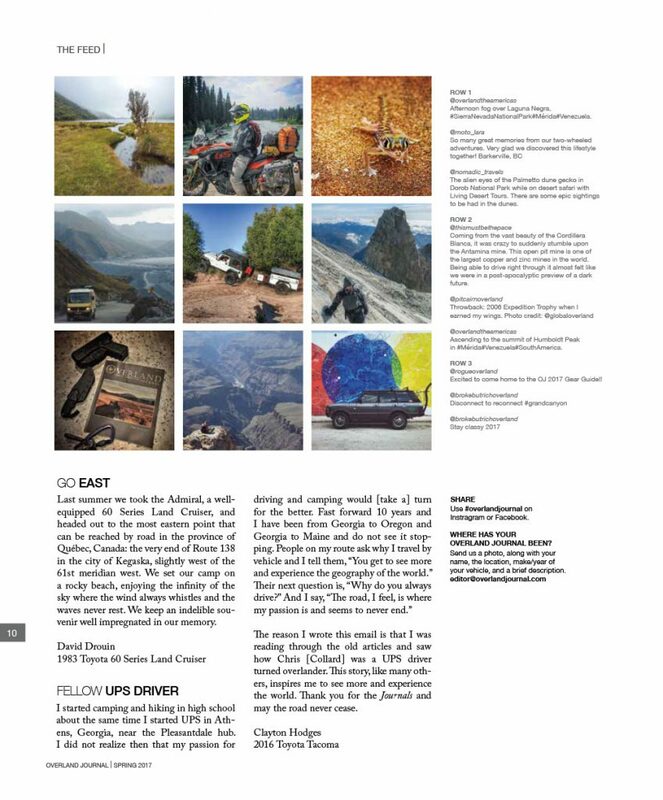 We're really stoked that a few of our photos have been featured in Overland Journal! Thanks guys! We are honored our friend Paul Strubell of DirtOrcas.com published a fun interview about our trip. Thank you Paul for the kind introduction and for sharing a little about our trip. 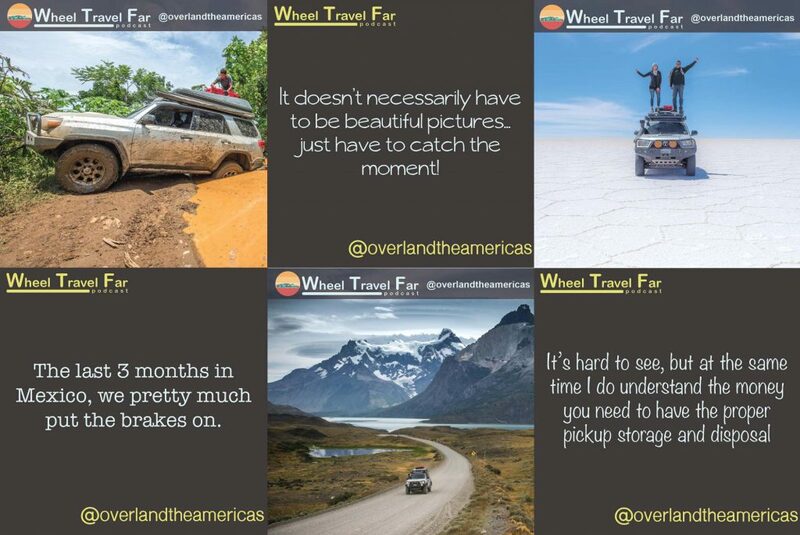 "They [Overland The Americas] are the ones experiencing the trenches and mountain tops, but they do a wonderful job of making you feel like you are part of it as well, though their photography and story telling. I have included just a small sample of their amazing journey here, but you can view additional photos and really dig into the spirit of their trip and the many amazing places they have passed though with social media. I highly recommend following their travels on Instagram and Facebook. One of the best parts about following their trip is that they seem to really know how to soak up the culture and take the road less traveled. They take the time to explore individual places and it never feels like they are in a rush to get to the next destination. They are a great reminder that life is truly meant to be lived to the fullest." Make sure to check out DirtOrcas.com to read his great inspiring stories! Thank you guys for featuring our photo along with all the other amazing photos in the [FRAMED] section of the Winter 2016 issue! Visit TCT Magazine and subscribe to this awesome Toyota cruisers and trucks publication. You can download the full Winter 2016 issue here.